Residents and students at Clifton Creek PS are pleased to be making use of the newly upgraded RECYCLE STATION just inside the school gates. 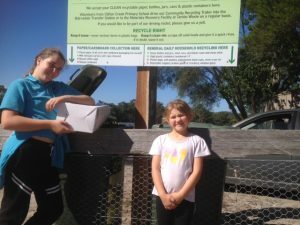 As successful recipients of the East Gippsland Shire “Community Environment and Sustainability Grants” late last year, the school was able to make the most of its grant to enhance waste management practices in our local area and help prevent recyclables ending up as landfill. In upgrading the recycling collection site, a secure recycling bin bay has been installed at Clifton Creek Primary School complete with professional signage and wind proof fastenings. The parking area for the community trailer was levelled to assist ease of hitching/unhitching the trailer. Educating our community was the other action with a flyer ( click here to view ) distributed to 100 households in the vicinity of the school as well as through school newsletter. This flyer includes latest details of recycle protocols relevant to our local area. “It is great to be confident we are placing the right article in the appropriate place and to know that it is being taken for recycling rather than dumped in landfill,” commented Business Manager Robyn Hermans. Thank you to the East Gippsland Shire for helping us improve our recycle practices at Clifton Creek in the absence of kerbside collection of recyclables and also thanks to the volunteers who run the trailer into town on our behalf. Previous postSausage Sizzle Fundraiser Next postBig bicycle thankyou!